Drop Cookie Dough the kids can eat! Baking season is in full swing at our house and as December elbowed out November, I pulled out this tried and true drop cookie recipe. I clipped this from the local Williamson County Parent magazine in 2005. You are going to love these simple, yummy cookies! Our plate didn't look like that for long. The very best part is this is a no egg recipe so your kiddies~ and you can eat the dough! Stir up a batch of fun and happy memories today with your family. Enjoy! 2. In large mixer bowl, beat margarine and sugar until creamy. 3. Beat in water, oil, and vanilla. 4. Stir together dry ingredients, gradually add to sugar mixture. 5. Drop dough by rounded spoonfuls onto ungreased cookie sheets. 6. Bake at 375° for 9 to 11 minutes, until golden. 7. Leave on cookie sheets for a few minutes, then transfer to cooling racks. Store in an airtight container. I've also baked up a few dozen Old Fashioned Oatmeal Raisin Cookies which turned out really well I think in large part because I used dark brown sugar. What is your favorite cookie recipe? Please share! I've never let an egg stop me from eating the raw dough. Sometimes we'd just mix up the batter and eat all the dough. Did your mother tell you that if you eat raw dough you would get worms? Ha! Mine did but then she'd let us lick the batter out of the bowl. Life is full of contradictions! The older I get, the less cookies are made in this home. It all seems to want to slide to the abdomen and hips. It's probably all that 'slippery butter' that does it. 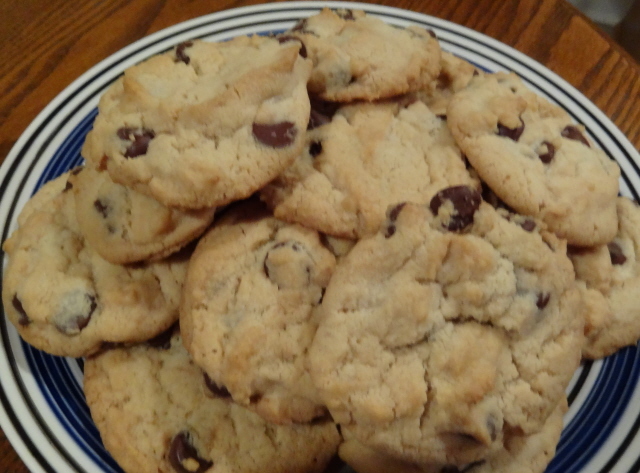 Your recipe is very close to mine for chocolate chip cookies. It's a pretty dangerous time of year to have those things around! Yes, the butter and sugar is gonna get me too if I'm not very careful! Now I'm curious Donna, just how do you leave the cookies for your garbage man? I have a love/hate relationship with cookies. For me I've got to eat the GF kinds, but my family loves Pecan Snowballs. I send them out in my care packages, but in order to do that I've got hide them in the freezer from my husband. I'll be posting the recipe soon. Sadly my camera has been acting up and I hate posting without pictures. Your Pecan snowballs sound so good! I know my hubby would like them because he loves Pecans. Can't wait for you to post the recipe!